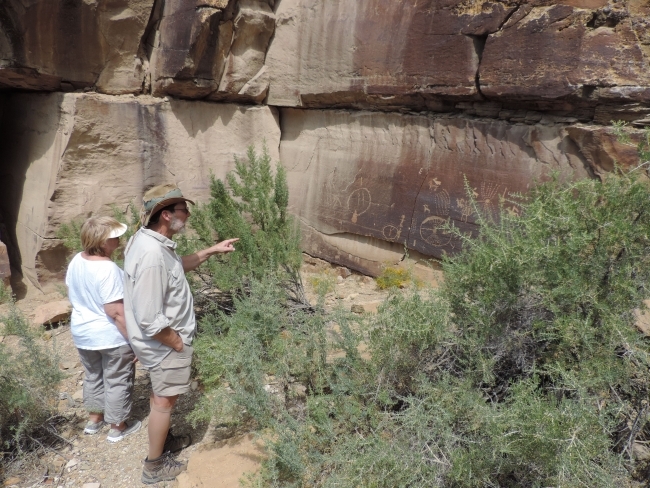 Michael and trustee Kay Sundberg observing the pictographs in Nine Mile Canyon on the 2015 board trip. Our friend, colleague, and trustee Michael Mahaffey passed away on Wednesday, November 11, 2015. To honor and recognize the service of Michael, Utah Heritage Foundation is providing an opportunity to recognize Michael's legacy through The Michael Mahaffey Legacy Fund. This fund will be a new revolving loan fund that will put Michael's professional and personal philosophies regarding historic preservation to work across Salt Lake City by supporting high quality rehabilitation of historic homes. The Michael Mahaffey Legacy Fund will be an addition to the other loan funds that Utah Heritage Foundation has managed and loaned out over $2 million dollars from since 1971. Coming to know Michael through his contracting business Home-Tech, Inc., he came into the Utah Heritage Foundation family in 2000 as a member of the Revolving Loan Fund Committee (now known as the Historic Properties Committee). He enjoyed his volunteer role (read as, he found a bunch of people more nerdy about historic buildings than he was) and raised his level of support in 2001 with sponsorship of the annual historic homes tour, to which he's consistently supported through 2015. In 2010, he joined the Board of Trustees. Michael was named trustee of the year in 2012 after leading the effort to begin our partnership with the Redevelopment Agency of Salt Lake City for the Preservation at Work Project House (photo at right). This was Utah Heritage Foundation's first effort to conduct direct rehabilitation since the early 1980s, but Michael was confident in the prospect of success. Through his vision and commitment to making the little house on Pugsley Street usable and attractive again, he brought in numerous contractors and professionals to provide expertise and product. Through the many years, Michael provided dedicated and exemplary service to the organization, and we know he had fun doing it. He and his wife Sherri Evershed, joined us at numerous events and trips around Utah and many in historic preservation across the state enjoyed his (and their) company. Michael's legacy of historic preservation in Utah is seen through his company's high quality work on historic houses in many communities. Several have won awards. Probably more importantly to Michael, all have been improved to the point that demonstrates how historic buildings can continue to be used by their families to contribute to the vitality of neighborhoods and economy of cities. He's left this legacy to us all and through The Michael Mahaffey Legacy Fund, we collectively should pledge to perpetuate it. Any and every donation to The Michael Mahaffey Legacy Fund will be accepted in his honor. To donate, visit our donation page.